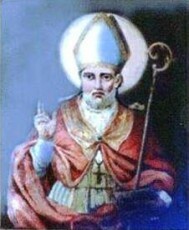 St. Aspren was a first century Christian saint and is venerated as the first bishop of Naples. He lived at the end of the first century and just into the second century. We have confirmation of this by archaeological studies regarding the early Church as well as “Aspren” was a common name during this time of the Roman Republic and the early years of the Roman Empire. The Marble Calendar of Naples attests to Aspren’s episcopate as lasting twenty-three years. Nothing is known of his life, but an ancient legend holds that St. Peter, on his way to Rome, stopped in Naples and converted an older woman identified as Candida the Elder, after he cured her of her illness. Many conversions to Christianity took place at this time in Naples, including Aspren, who was converted either by Peter or Candida herself. Legend tells us that Aspren himself was sick, and was cured by St. Peter, but this cannot be confirmed. The legend continues that Peter consecrated Aspren as Bishop of Naples, in Campania, Italy, after he converted him to Christianity. St. Peter asked him to construct the oratory of Santa Maria del Principio, which would form the basis for the basilica of Santa Restituta. After Aspren’s death, numerous miracles were attributed to him, and his sepulcher rested in the oratory of Santa Maria del Principio. John IV, Bishop of Naples translated Aspren’s relics to the basilica of Santa Restituta, in the chapel dedicated to Aspren. A silver bust of Aspren is found in Naples Cathedral. In Naples, two churches were dedicated to him as well as the chapel in San Aspren in Naples Cathedral. Although there is not much known about St. Aspren, it should be comforting to us that the Church was well on it’s way to growth, when St. Peter arrived in Rome and started with conversions – such as that of St. Aspren. On St. Peter’s way to Rome, legend tells us that he healed St. Aspren, converted him to Christianity, and consecrated him the first Bishop of Naples. All of this came first hand to St. Aspren, from Peter who walked with Jesus. We know that nearly 2,000 years later, we can draw strength from the lives of our early saints, who gave all for the building up of our church. By venerating St. Aspren and asking for his intercession in our lives, we too can build up the church in our own walk of life.